Two women. One party. 30 years apart. 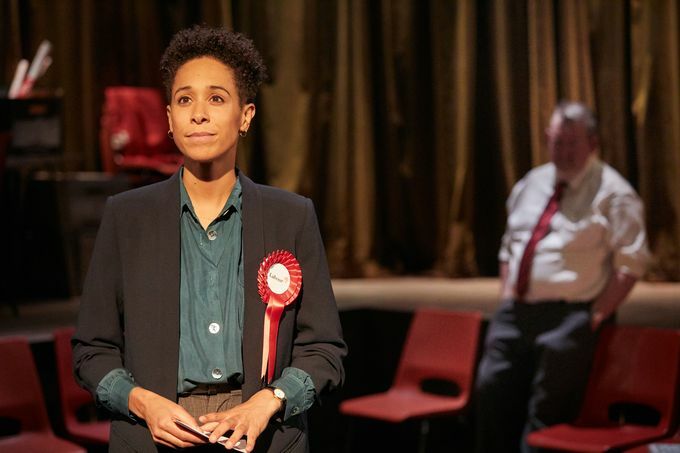 Steel, showing at Sheffield’s Crucible Studio until 6 October, follows the lives of two women in the Labour party as they face the biggest election of their careers so far. In 1988 Josie Fleetwood (Rebecca Sproggs) is a young steel engineer, Labour party member and keen to help her community. Local politics is ‘pale, male and stale’ by its own admission, but keen to take on women with Josie’s wit and passion, albeit to talk about their childcare policies, rather than the steel industry which runs through her veins. In 2018, Scroggs plays Vanessa Gallacher, ex MP turned metro mayor candidate. Born in Sheffield, Vanessa turned her back on the north for the bright lights of London, and has now returned to the Steel City as Labour’s candidate. But there’s concerns she doesn’t relate to the people of God’s Own County. Playing opposite Scroggs is Nigel Betts. In 1988, he is Dai. A bumbling but seemingly well intended councillor, keen to introduce Josie to the party to encourage diversity in Labour. In 2018, he is Ian. A Yorkshire man through and through, tasked with getting Vanessa through the election and ensuring the new mayor is Labour. Rebecca Scroggs as Josie in Steel. Photo by Mark Douet. Chris Bush’ writing is quick, witty and hilarious, navigating issues around race, gender and age in politics with dialogue smattered with quips and amusing references to the caricatures we so often see in politics. 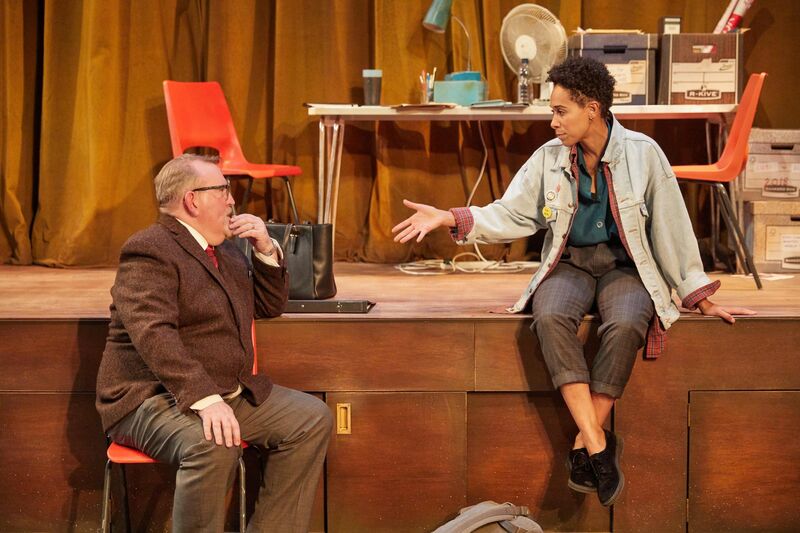 When things turn dark, Bush’ script is raw and realistic – a genuine portrayal of the hurdles women face in politics both then and now. Sheffield is ever present throughout Steel – Bush’ script makes subtle references to the Steel City throughout, and reimagined classics of Arctic Monkeys songs soundtrack each shift from modern day to the 80s and back again. Steel is a tale of two women, three decades apart, but the issues covered are more widespread than what it means to be female and in the Labour party. Gender, race, age, whether or not you take your latte with soy milk or dairy, are issues well explored and well portrayed on the Studio’s stage. Steel is showing at the Crucible Studio until 6 October. Buy tickets here.